Mycena citricolor is a parasitic basidiomycete. 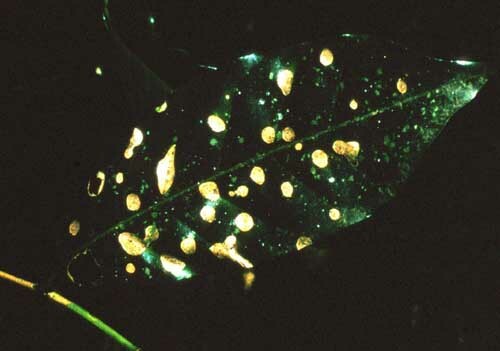 This fungus infects the leaves of the coffee plant in Central America. Mycena citricolor reacts to temperature in terms of growth and bioluminescence. It can grow at temperatures between 5°C and 25°C. Once the temperature reaches 30°C the Mycena citricolor will no longer grow (Weitz et al, 2006). The Rhizopus stolonifer is another fungus that grows at the same temperature as the Mycena citricolor. This is the fungus that is used in creating the birth control pill. The luminescence increased when growth increased and decreased when growth decreased. This shows a positive relationship between luminescence and growth in the Mycena citricolor. Light does not have much of an effect on the rate at which Mycena citricolor grows. This basidiomycete grows at the same rate under twenty-four hours of darkness, twenty-four hours of light, and twelve hours of light followed by twelve hours of darkness (Weitz et al, 2006). 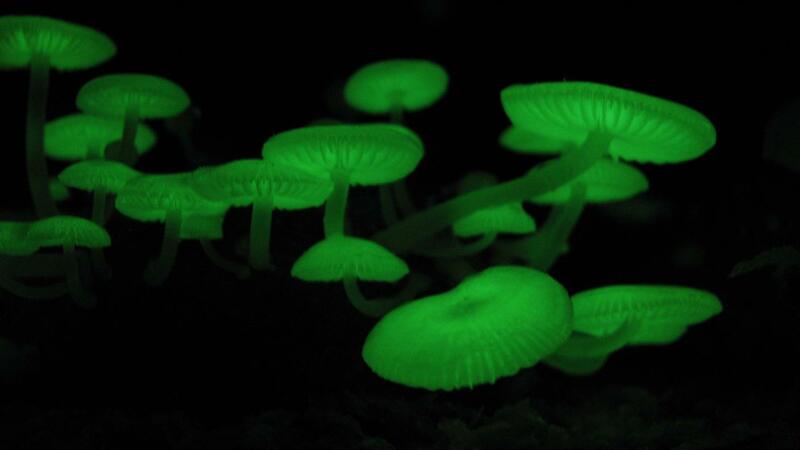 Light does have an effect on the bioluminescence of the Mycena citricolor. Under periods of complete darkness the luminescence of this fungus was at its highest. Under periods of all light the luminescence was also very high. The luminescence was much lower under periods of twelve hours of light followed by twelve hours of darkness (Weitz et al, 2006). The pH balance has an effect on growth and the bioluminescence of Mycena citricolor. The optimum pH level for growth was at 4. A pH of 6 was when the fungus started to grow poorly and anything over 7 meant there would be no growth at all. When it comes to luminescence a pH between 5 and 6 was when there was the most luminescence (Weitz et al, 2006). The Mycena citricolor’s bioluminescence only occurred during periods of mycelial growth in the fungus. This shows us that the luminescence of Mycena citricolor is reliant on the fungus growing. This means that there is a relationship between the luminescence and the metabolic activity (Campbell et al, 2002). The luminescence is created by a luciferen-luciferase reaction. This reaction needs NADP to occur. Since luminescence has a relationship with the metabolic activity of the fungus, we can use the luminescence to determine the rate of metabolic activity in Mycena citricolor (Campbell et al, 2002). Now that you've read about the Form and the Function of the Mycena citricolor, check out the Interactions that this fungus has with other organisms or go back to the home page.